Directed Alignment Technique (DAT) is a gentle neural release method that is used to relieve aches and pains as well as to enhance and improve general health and wellbeing. Body alignment practitioners are able to restore balance to the neural pathways and channel communication to the blocked areas by use of a gentle and safe hands-on technique. This is achieved by subtle touch to specific neural access points along the neck and spinal regions. By using this method the practitioners are able to locate the source of the imbalance thereby assisting the body in releasing adverse tension and restoring Neural Balance. The primary focus of DAT is to improve the function of one's nervous system. One's nervous system suffers a penalty every time the conditions of everyday life become too much for it to process or cope with. As a result the brain and nervous system becomes overwhelmed and disorganised. Body alignment practitioners can restore the body's ability to heal and maintain the natural God-given right to good health, a balanced nervous system and emotional wellbeing. In essence DAT aims to stabilise and achieve a natural harmonious balance for the body to operate efficiently and effectively. DAT is not to be confused or misinterpreted as a diagnosis or treatment for specific conditions or diseases. It is a useful and beneficial treatment that safely and effectively releases stress and adverse tension. 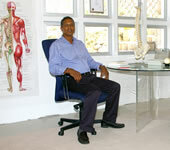 The founder of Directed Alignment Technique (DAT), Patrick Moodley, qualified as a Body Stress Release Practitioner in 1997. For seven years, Patrick ran a successful Body Stress Practice at the Broad Road Medical Centre in Wynberg. He resigned as a member of the Body Stress Release Association to expand his knowledge and understanding of the nervous system. He has incorporated this experience with biofeedback training to create the unique Directed Alignment Technique in South Africa. The growth of DAT has been phenomenal, and the demand for more practitioners has inspired Patrick to pioneer the DAT Academy.